IU 802 APD is available for header and trench, with optionally different sampling mode. It is an intelligent discrete 12/ 24 sampler designed specially for collecting discrete samples of effluent at pre-determined interval in individual bottles. This helps precise monitoring of products / effluent at different time. You can select no. of samples / batch (up to 600), sample volume, batch start time, batch end time, programmable Flow rate for trench. 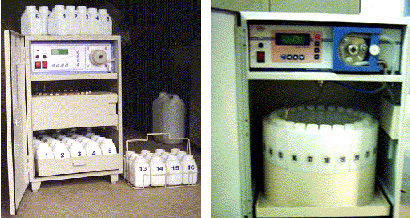 (10 to 100 ml / minute in uniform & non uniform mode) Auto purging systems. In which you can get samples on uniform time duration (user programmable) from batch start time (user programmable) up to batch end time. In this mode you can take samples at pre-determine time (real time based user programmable.